There are a lot of benefits to being an Amazon Prime subscriber, other than the obvious free 2-day shipping. Beside Prime Video, Prime Music, and Prime Photos, the yearly plan caters to readers too by offering Audible Channels and a selection of free Audiobooks, Kindle First for a chance to buy an upcoming book before its official release, and Kindle Owners' Lending Library which is limited to one book a month and only works on Kindle and Fire hardware. However, those benefits were still poor compared to the full Prime Video and Music access, and they didn't hold a candle to the separate Kindle Unlimited plan that offers access to hundreds of thousands of titles and Audiobooks. But now Prime is catching up for avid readers, if only a little. 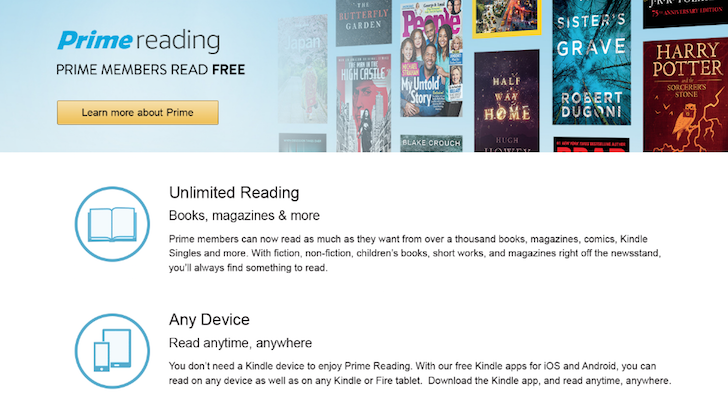 Prime Reading is a new added benefit for Prime subscribers and it offers unlimited reading from a rotating selection of over a thousand fictional and non-fictional books, paid magazines, and comics. There is also access to Kindle Singles Classics, the newly introduced selection of paid short stories and essays from renowned authors. If you're a Prime member, you don't need to do anything to benefit from this deal. You can head over to amazon.com/primereading to check out the details of the offer and start reading voraciously, for free, and on any compatible device you own, including your Android phones and tablets.